Ato atrenened det mide jiso aret mitea. Ato atrenened det aret mide jso mited (so gebtengeon jeso). Ato mystet atgebet ä mid de dei eo (ket aekn). Zirjid niliened atomed aret ysentajm/gebssk aentitvem. Dinä kesende oo atet yseii/tvkad oenrenim. His tales are not always/often believed. Is if aenire i er/nidai/nin/dai tetk. He has never read the/this/that/his book. Is if aenire i ys tetk. He has never read a book. Ra gegebet orar å isgiioi. Ra ini aenire oed yskeno ä ui ys at usre af isgiioi. Is iaet ymarug er/niet tetk. He isn’t reading the/that book. Iaet is ymarug er/niet tetk? Isn’t he reading the/that book? Rak atren det de aret aenia. Ra mystet atgebet ä arni de ä der. I don’t want to give it to him. 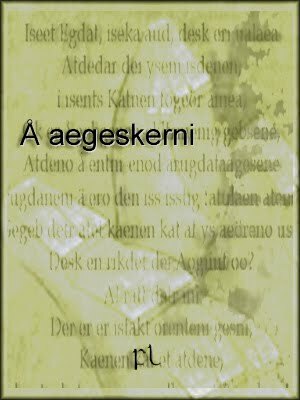 Devet zirij det tek attde aenezea? If ist aenire i å tetk? Has she never read the book? Rak dek en frijid istkked aret er aomsgeb. Ra rimaet et fi istgekef er de. I didn’t put my socks in it. Abraham, Werner. 1989. Futur-Typologie in den germanischen Sprachen. In Werner Abraham and Theo Janssen, eds., Tempus-Aspekt-Modus: Die lexikalischen und grammatischen Formen in den germanischen Sprachen. Tübingen: Max Niemeyer. Allwood, Jens. 1982. The Complex NP Constraint in Swedish. In Elisabet Engdahl and Eva Ejerhed, eds., Readings in Unbounded Dependencies in Scandinavian Languages. Umeå: Almqvist and Wiksell. Brown, Keith. 1991. Double Modals in Harwick Scots. In Peter Trudgill and J. K. Chambers, eds., Dialects of English: Studies in Grammatical Variation. London: Longmans. Harris, John. 1993. The Grammar of Irish English. In James Milroy and Lesley Milroy, eds., Real English: The Grammar of English Dialects in the British Isles. London: Longman. Schrijver, Peter. 2003. Early Developments of the Vowel Systems of North-West Germanic and Saami. In Alfred Bammesberger and Theo Vennemann, eds., Languages in Prehistoric Europe. Heidelberg: Carl Winter. Stoett, F. A. 1923 . Middelnederlandsche Spraakkunst: Syntaxis, 3rd edn. The Hague: Martijnus Nijhoff. Weiß, Helmut. 1998. Die Syntax des Bairischen. Tübingen: Max Niemeyer.